Formula One’s so-called ‘winter world championship’ is over, beginning the countdown the first test that really matters: round one, the Australian Grand Prix. But with the first championship-round session still an agonising 10 day away, allow me to fill the remaining evenings of the preseason with the sort of hype and speculation F1, with its myriad of data and times, is particularly good at. Mercedes did as Mercedes does in testing: it kept its head down, churned out the laps and established a solid baseline from which to work for the rest of the season. The team’s preseason programme comprised lots of long-run tests on the medium compound tyre, the most common Pirelli variety available throughout the season, and the numbers bear witness to its success. 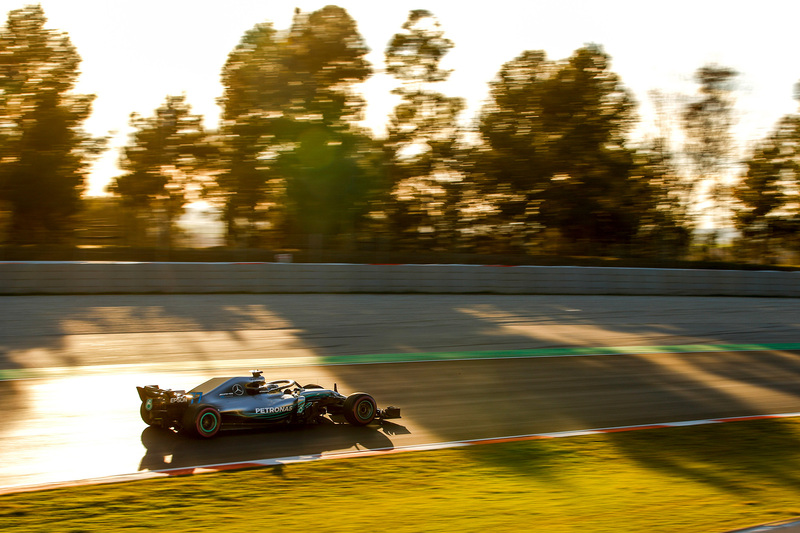 Mercedes completed 1040 laps of the Circuit de Barcelona-Catalunya across all eight testing days, over 100 laps more than anyone else and just 56 laps fewer than it did last year despite day three being written off in snowed-out conditions. It would be easy to be deceived by the Silver Arrows’ unextraordinary fastest lap — 1:18.400, 1.218 seconds off Ferrari’s headline time — but neither Hamilton nor Bottas touched the hypersoft tyre, and with the Mercedes power unit tipped to generate more than 1000 brake horsepower this season, it’s safe to assume this far from the car’s ultimate potential. Further, the team’s race pace was revealed to be blisteringly quick, with F1 Metrics pointing to a devastating eight-lap stint at the hands of Valtteri Bottas as evidence that the W09 should be considered the stand-out favourite of 2018. The picture behind Mercedes, however, is far murkier. Red Bull Racing looks to have re-established itself in the ball park thanks to an early car rollout and Ferrari is likewise thereabouts. Both teams have key early weaknesses. For Red Bull Racing it is undoubtedly the underpowered and unreliable Renault engine. A similar power deficit to 2017 would leave the team hamstrung in the fight for pole on Saturday, leaving it with perhaps too much to do on Sunday given the power unit’s disdain for being pushed too hard. Ferrari ended the test with the fastest time, breaking the unofficial lap record, but its low-fuel, max-power glory runs belied potential chassis problems. The SF71H is an evolution of the 2017 car using a Mercedes-style long wheelbase and a Red Bull Racing-inspired high rake, but trackside reports suggest the Italian team is not yet on top of either development, with some noting the floor was occasionally scraping the asphalt. A further question mark is Ferrari’s power unit, which billowed oily smoke throughout the test, apparently as a side-effect of modification to adhere to the FIA clampdown on power-boosting oil burning. An underpowered or uneconomical engine could be enough to hand Red Bull Racing an advantage. Ferrari and Red Bull Racing held the first and third quickest times, sandwiching an unlikely McLaren-Renault in the middle after Fernando Alonso pulled out all stops with mere minutes remaining on the final day. But with the fewest laps recorded — almost 100 fewer than anyone else — after a litany of engine and other problems, it would be foolish to suggest a return to the podium will be as easy as switching from Honda to Renault this season. McLaren racing director Eric Boullier has protested that his team has a right to be “ambitious”, but the pressure of the team’s high-stakes gamble falling over after an off-season of expectation-building is certainly being felt. Doubly painful will be that Toro Rosso-Honda blitzed testing, completing the third highest lap total of the preseason. Thing went so smoothly that Brendon Hartley suggested his team is “definitely in the fight for those points” in Melbourne. Renault remains favourite to be fourth thanks to an aggressive development programme backed with its manufacturer dollars — already its exploiting of the rules is catching the attention of rivals — but getting the best from a power unit that remains stuck with a 2016-spec energy recovery system for reliability reasons could be the limiting factor in the quest for fourth in the standings. Force India remains an unknown quantity, having run a basic aero package to gather correlation data before bringing a major upgrade to the Australian Grand Prix, but the dark horse of the midfield is Haas in just its third year in Formula One. F1’s only American team ranked low on the lap count but put in some eye-catching performance runs, including a fastest lap on the supersoft tyre which, corrected for tyre performance — Pirelli estimates a 1.3 to 1.4-second difference between the supersoft and the hypersoft compounds — would place it within striking distance of Ferrari. Reviewed well on track with perhaps the fastest engine in the midfield bar Force India’s Mercedes power unit, Haas could emerge an unlikely contender for best-of-the-rest status. Bringing up the rear of the pack after testing is Sauber, as expected, but also, regrettably, Williams. Williams’s testing benchmark, complete with the slowest best lap of all teams, is particularly disappointing, continues its declining fortunes since successive third-place finishes in 2014 and 2015. Dreams of contesting fourth in the standings appear out of the question. Positive at least is that its power unit is sound and that the team recorded the fourth highest lap total, but an answer to the question of the development capability of 19-year-old Lance Stroll and rookie Sergey Sirotkin could be key to salvaging the season. Sauber, on the other hand, begins with low expectations. Already the updated Ferrari power unit, after running the cut-price 2016 version last season, has allowed a step forward, and though new Alfa Romeo backing is yet to translate into performance parts, these will undoubtedly flow through the season and into 2019. These assessments of course come with the usual preseason testing caveat that details like fuel loads, engine mapping and testing programme goals remain unknown, and strategic sandbagging and showboating only further muddy the results. The numbers nonetheless make for an intriguing wait for next weekend’s Australian Grand Prix.